Born at Edinburgh, Scotland, in 1832, son of Joseph Bathgate and Grace Hyslop, brother of Robert Dundas Bathgate, he emigrated to Wisconsin in 1852 and settled at Janesville, where his father died in 1856 and his mother in 1874. Bathgate went into business in Montreal in 1861, remained there until 1870 when he moved to Guelph, Ontario to farm. 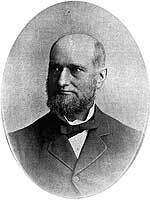 In 1878, he moved to Winnipeg and engaged in the furniture business until 1883, when the Manitoba Electric and Gas Light Company was founded, and he was appointed its Managing Director. In 1871, he married Margaret Armstrong Loughrin, with whom he had four children: James L. Bathgate, Joseph Bathgate, Elizabeth Loughrin Bathgate (wife of C. G. McGreer) and Maggie A. Bathgate. In 1882, he served a one-year term on the Winnipeg city council. He died at his Winnipeg home, 267 Spence Street, on 21 January 1903. “Wm. Bathgate is summoned”, Manitoba Free Press, 22 January 1903, page 9.